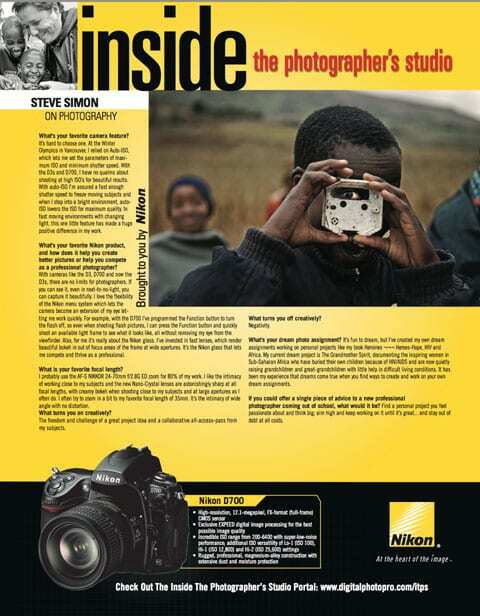 A couple of years ago, I had the great honor of being profiled in this Nikon ad. At the time, I was using a D700 camera but I’ve updated the copy with my 2014 thoughts and current gear; the rest of my answers still hold true today.What’s your favorite camera feature? It’s hard to choose one. At the Winter Olympics in Vancouver, I relied on Auto-ISO, which lets me set the parameters of maximum ISO and minimum shutter speed. With the D4S and D810, I have no qualms about shooting at high ISOs for beautiful results. With Auto-ISO, I’m assured a fast enough shutter speed to freeze moving subjects, and when I step into a bright environment, Auto-ISO lowers the ISO for maximum quality. In fast-moving environments with changing light, this one little feature has made a huge positive difference in my work. With cameras like the D4S, DF, D610 and now the D810, there are no limits for photographers. If you can see it, even in next-to-no-light, you can capture it beautifully. I love the flexibility of the Nikon menu system, which lets the camera become an extension of my eye, allowing me to work quickly. For example, with the D810, I’ve programmed the Function button to turn the flash off, so even when shooting flash pictures, I can press the Function button and quickly shoot an available-light frame to see what it looks like—all without removing my eye from the viewfinder. Also, for me, it’s really about the Nikon glass. I’ve invested in fast lenses, which render beautiful bokeh in out-of-focus areas of the frame at wide apertures. It’s the Nikon glass that lets me compete and thrive as a professional. What’s your favorite focal length? I probably use the AF-S NIKKOR 24-70mm ƒ/2.8G ED zoom for 80% of my work. I like the intimacy of working close to my subjects, and the new Nano-Crystal lenses are astonishingly sharp at all focal lengths, with creamy bokeh when shooting close to my subjects and at large apertures as I often do. I often try to zoom in a bit to my favorite focal length of 35mm. It’s the intimacy of wide angle with no distortion. But more and more I’ve been going to the fast prime lenses, shooting close to wide open for even creamier bokeh and powerful images. I was photographing at the Phelisanong orphanage in Lesotho (www.phelisanong.com) when I noticed one kid mimicking me with his “camera.” As I moved closer and worked the situation, this good-natured “photographer-to-photographer” shootout image was the result. I realized after looking at this photograph that I first found photography when I was about his age. I was lucky and could pursue my photographic dreams, but for orphans like him with so much potential, dreams are much more difficult to achieve. The challenge of a great project and a collaborative all-access pass from my subjects. It’s fun to dream, but I’ve created my own dream assignments working on personal projects like my book Heroines & Heroes: Hope, HIV and Africa. My current dream project is The Grandmother Spirit, documenting the inspiring women in Sub-Saharan Africa who have buried their own children because of HIV/AIDS and are now quietly raising grandchildren and great-grandchildren with little help in difficult living conditions. It has been my experience that dreams come true when you find ways to create and work on your own dream assignments. If you could offer a single piece of advice to a new professional photographer coming out of school, what would it be? Find a personal project you feel passionate about and think big; aim high and keep working on it until it’s great—and stay out of debt at all costs. Previous articleStreet Photography Workshop NYC -Sold Out! Hola, gran trabajo el sullo! Muy inspirador. El 2004 yo empece en la fotografia para dejar el vicio a cigarrillos, fue la mejor movida de mi vida.